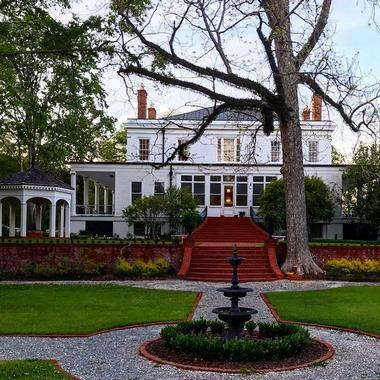 Named one of the finest Antebellum era houses in the “deep” south as well as being listed on the National Registry of Historic Places in Mississippi, Brandon Hall Plantation offers rooms, suites, and cottages in a gated community. It is a bed and breakfast that is set on a historic estate surrounded by rolling hills, a stocked pond, beautiful gardens, and native plants. There are also a variety of outdoor opportunities for overnight guests and many local historic places to visit. Rooms and suites at the Brandon Hall Plantation are available in the Main House and the Garden Cottages. Each room has its own name and guests can request specific rooms when staying on the premises. The majority of the rooms are located in the Main House. On the first floor is the Louise Suite, which is just over 700 square feet and sleeps two in a queen bed. The second floor (which is accessible both by stairs and by elevator) has the Rachel Leigh, Andrea Lauren, Sarah Elise, and Rebecca Delain rooms. The Andrea Lauren and Sarah Elise rooms both sleep two in a queen bed. They are around 400 square feet apiece with ensuites private baths. The Rachel Leigh and Rebecca Delain rooms both sleep three. The Rachel Leigh room is about 500 square feet, while the Rebecca Delain is slightly larger at just under 800 square feet. Each has a queen bed as well as a twin bed. The Rachel Leigh room has an ensuites private bath, while the Rebecca Delain has two as well as a private dressing area. Be aware that no children under the age of 12 will be allowed in any of the rooms on the second floor. Outside of the Main House, there are two Garden Cottages available for overnight lodging. The Jeanne Louise is the larger cottage, sleeping six guests in one king bed, one queen bed, and two twin beds. It complies to the Americans with Disabilities Act and is 1000 square feet. The other cottage, the Carpenter Cottage, is also 1000 square feet but only sleeps two in one king bed. Both come with a fully equipped kitchen, a living area, a full bathroom with a washer and dryer, and a porch. All of the suites, rooms, and cottages offer internet access, air conditioning, and a flat screen television that provides satellite channels. No smoking or pets are allowed on the premises. Brandon Hall Plantation is a gated hotel community. Served daily in the Main House is a full, southern breakfast. This breakfast offers traditional American staples like pancakes, waffles, bacon, eggs, and grits. Coffee and tea will also be served. Breakfast is served on historic china and hotel guests must dine in the dining area. 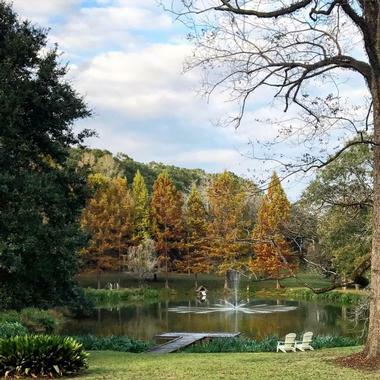 The grounds of the Brandon Hall Plantation have a variety of options for things to do. The premises have walking paths through the surrounding forests and a private family cemetery. There are also guided tours that are offered from Wednesday through Saturday for an additional charge. Children 12 and under are free. These tours are by appointment only. 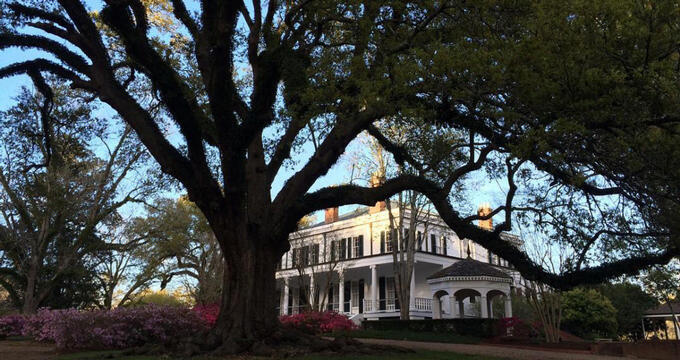 There are many historical attractions within a five-mile radius of the Brandon Hall Plantation. The second largest United States Indian mound, Emerald Mount, is located just a few miles away at mile marker 10 of the Natchez Trail. It is noted by a historic marker and, although the majority of the mound is inaccessible, there is a viewing platform and a multi-acre park nearby. Another local home, although not one open to overnight guests, is Mount Locust. Located at marker 15 of the Natchez Trail, the home is part of the National Parks Service and can be toured. It is one of the oldest structures in the state. Just beyond the city limits of Natchez is the Christ Episcopal Church, located at Church Hill. It is a plantation-based community that allowed members of the congregation to stay together before the invention of faster travel. Guests can enjoy the property on their own or take a guided tour. For a full day experience, hotel guests can bike, walk, jog, horseback ride, or drive on the Natchez Trace Parkway. 440 miles in its totality, Brandon Hall sits on only a small portion of the scenic road that runs from Natchez, Mississippi to Nashville, Tennessee. The road introduces guests to the history of the area, which stretches back to the 1700s.